You are here: Home / Jamaica Destination Wedding / Why Bliss Bridal Boutique ? As a Destination Wedding Specialist, every year I try to attend as many Destination Wedding Expos in my clients preferred destinations as possible to meet with local vendors. 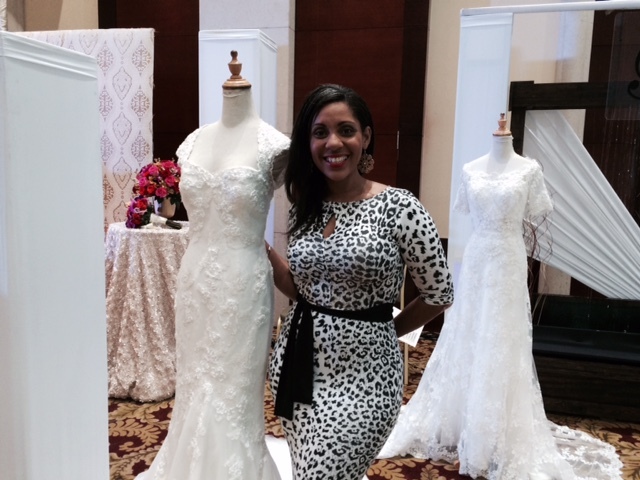 I recently traveled to Jamaica to attend the Jamaica Bridal Expo in Montego Bay, Jamaica and I am so excited to share information about Bliss Bridal Boutique with my destination wedding brides. So you have decided that Jamaica is the perfect destination for your wedding, found the prefect resort now you start the search for the perfect wedding dress. Always the concerns of “How do I get my dress to the wedding?” or “Can I carry it on the airplane?” come up in the discussion – with this thought in mind I am so glad I had the opportunity to spend time with Sara Stanford- managing director for Bliss Bridal Boutique in Jamaica. 1. Brides can try on any gown from the designers carried in the boutique at their local bridal shop in the United States, they can then contact Bliss Bridal to rent that very same gown here in Jamaica. Once the bride arrives in Jamaica, they are met with by a Bliss Bridal Consultant and a seamstress. Brides can then try on their gown and the seamstress will make minor alterations, and brides can have a re-fit to make sure she is perfectly happy with her wedding gown. Just like at home ! 2. Brides can actually try on gowns in the United States and actually purchase their gown at Bliss Bridal once they arrive in Jamaica, and just as with option one, upon arrival the bride will be met by a Bliss Bridal consultant and seamstress. 3. Brides can also rent a wedding gown from the stock that bliss has in the Boutique. Brides can visit the Bliss Bridal Website above and make their selection based upon availability, the bride will be met at their hotel with her selection and a few similar options, at which point the bride can make their final selection. With poplar designers such as Maggie Sottero, Justin Alexander, Sophia Tolli and the Pronovias Fashion Group their is a wedding gown for even the most discerning bride.